Sir Paul will strike up the band before 60,000 fans tonight at FedEx Field in D.C. It was 45 years ago (though not today) that The Beatles played their first American concert -- at the Washington Coliseum, no less. Thievery Corporation -- the DC-based DJ duo of Rob Garza and Eric Hilton -- will bring its acid jazz/reggae/Indian classical/Middle Eastern/bossa nova music tossed with a lounge aesthetic (they did, after all, make their debut at DC's own 18th Street Lounge) on stage as the opening act. "We're excited and honored to open for Paul McCartney in our hometown of Washington, D.C.," Garza said in a statement. "Having a chance to play to his audience is unique for us and we're really looking forward to it." McCartney and Thievery Corporation aren't exactly meeting for the first time Saturday; they crossed paths back in April when both played the Coachella Festival, BeatCrave notes. 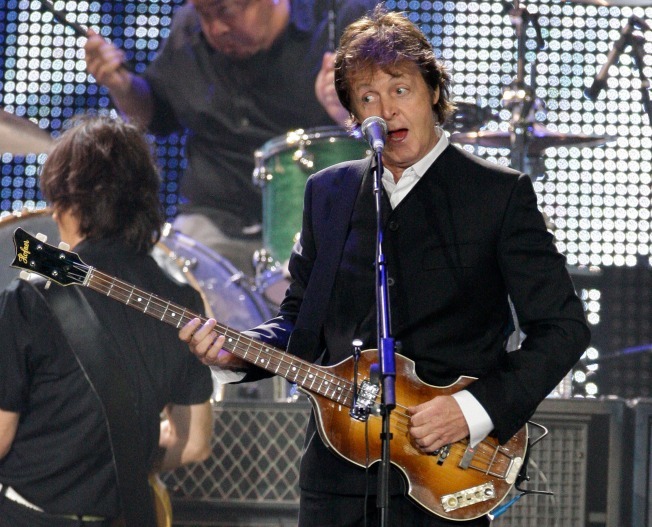 Washington is the third stop on the 67-year-old McCartney's summer tour.